1. 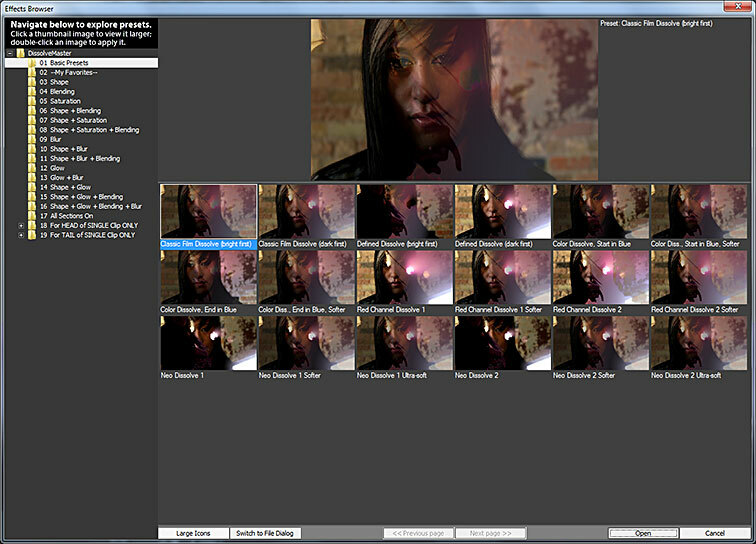 In the Transitions Room tab of PowerDirector (version 12 or later), drag-and-drop DissolveMaster from the Pixelan section onto the transition overlap between two video clips in a track of the timeline. 2. Click the Modify button above the timeline (or right-click the transition and choose Modify), then click the Stand-alone Effect button to open the DissolveMaster main window. DissolveMaster has two types of presets -- Effects Browser presets and Section presets. This is the most powerful and visual way to access presets and is where HUNDREDS of dissolve transition presets are located. Click the Click here to load a preset... button at the top of DissolveMaster (as shown by the smiley in the above illustration) to open a wonderful large Effects Browser window to visually choose/compare from nearly 500 pre-made preset effects (including those you have made and saved for future re-use). The Effects Browser is shown below. To save your own custom presets in the Effects Browser, use DissolveMaster controls to set up the desired look, then click the Save button in the main DissolveMaster control area. The Effects Browser is fast, but sometimes you may already know which preset you want to use, such as when you are applying the same preset repeatedly in a project. In that situation, selecting a preset by one of the following methods can be faster... To see recently chosen Effects Browser presets, click the Recent button. For a drop-down menu of Effects Browser presets, right-click the Click here to load a preset... button. To use a standard Open file dialog box, Alt-click the Click here to load a preset... button. • To toggle between viewing the source file image and the DissolveMaster preset, click the top large preview image in the Effects Browser. Unlike the Effect Browser presets, these change ONLY the controls in ONE section of DissolveMaster. Mixing presets from several sections is a quick and easy way to try hundreds of fresh dissolve transition variations. Click a blue FX folder icon at the right side of a DissolveMaster control section ("I" in the above illustration) to instantly change ONLY the controls in that section via handy presets we have developed. Use this to quickly and easily make hundreds of new effect variations. For example, try different Glow presets with your dissolve transition without affecting what you have set up in the other controls of DissolveMaster. 1. Sync two copies of the SAME clip in two adjacent tracks of PowerDirector's timeline -- one clip directly above the other clip copy. 2. Apply video effects (PowerDirector built-in video effects or third-party plugin effects) that you want to flow/animate to ONE of the two clip copies. 3. 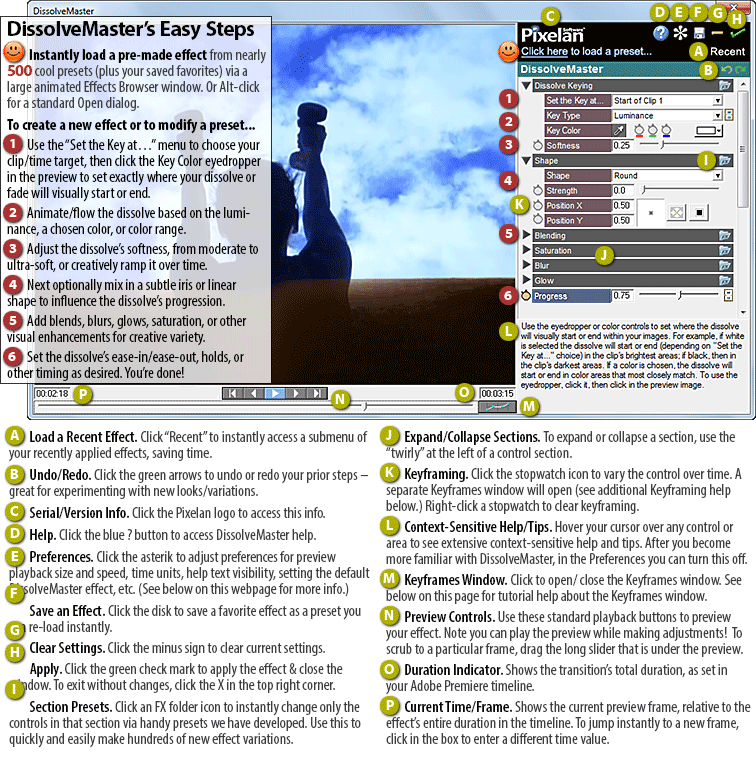 Following the "How to Apply DissolveMaster" steps above, apply DissolveMaster onto the beginning or end of the TOP clip copy. Done! Cyberlink PowerDirector currently does not allow transitions to be applied directly to titles in its Title track. One way to solve this is to create your titles as a .png file with an alpha channel — in an external program, such as Photoshop Elements. After that title image is imported, DissolveMaster can be applied directly to it in your PowerDirector timeline. However, there is also another method that can be faster for simple titles but doesn’t always produce correct output (due to current PowerDirector plugin architecture limitations): Drag your PowerDirector title into a Video track instead of the Title track. Then apply DissolveMaster directly to it. In the Preferences settings, you can customize DissolveMaster significantly to your video editing system's power and your working style. At right are the default Preferences Settings. Four Preferences options in particular may be handy for you to change (all shown with an adjacent red triangle). If you have very fast video editing hardware, consider turning off "Drop frames to maintain preview pacing." 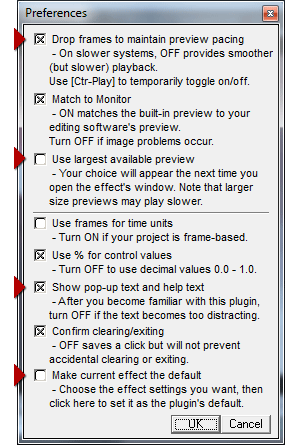 If you also have a high-resolution monitor and are editing with HD or larger footage, consider turning ON "Use largest available preview" which will use the largest preview size in DissolveMaster that can fit in your monitor while still leaving sufficient room for DissolveMaster's controls. Note that your choice for this setting will appear the next time you open DissolveMaster's window. After you become more familiar with DissolveMaster, consider turning off "Show pop-up text and help text." That will leave more vertical space for the section controls and also reduce any distraction from the ever-changing help text. Last but not least, you can easily set a new default transition anytime within DissolveMaster. Set up the transition control's as desired, then go into the Preferences dialog and choose "Make current effect the default." To VARY a control over time, use DissolveMaster's powerful but easy-to-use keyframing. First make sure the transition's duration is set to what you want in Premiere's timeline. Then follow the simple process below. Letters shown in quotes refer to the illustration in the Basics Within DissolveMaster section above. 1. Go to the frame where you want a control's value to BEGIN to vary over time during the transition. There are several ways to do this: use DissolveMaster's built-in Preview Controls ("N"), or enter a frame time in the Current Time/Frame box ("P"). Or click the stopwatch icon ("K") next to the control to open the Keyframes Window, then drag the blue vertical frame marker left or right. The Keyframes Window graph vertically shows the control's value plotted over time (horizontally, from 0% to 100% of the transition's duration). In this example, the transition's Progress is linear from 0% to 100%. 2. Adjust the control's value in the main DissolveMaster window. In the graph, if a keyframe already exists at the current frame, the adjustment will raise or lower that keyframe. If a keyframe doesn't exist, the adjustment will insert a new keyframe in the graph, as shown at right. Changing the control's value adds a new keyframe, if not already present. TIPS: To hold/freeze the transition's progress, horizontally flatten all or part of the line. To experiment and revert if needed to earlier keyframing, use the Undo/Redo buttons ("B") in the main DissolveMaster window. Note you can adjust keyframing while previewing plays. HANDY TIPS: Another way to add a new keyframe is to click ON an empty segment of the keyframe LINE, then drag that new keyframe wherever desired. As you drag, coordinates will appear and the preview will update. To move a keyframe only horizontally or vertically in the graph, Shift-drag it. To fine-tune the position, click the Zoom (+) button in the graph's top-left corner to zoom in, then drag as needed. (Repeat to zoom further.) To precisely position a keyframe, right-click it in the graph and choose Enter coordinates. 3. Use a bezier curve to accelerate or decelerate the control's value over time. Straight keyframe line segments as shown above represent a linear (constant) rate of change in an effect's value. To smoothly accelerate or decelerate it, which can provide a more professional/realistic look, curve the keyframe line by dragging a bezier curve handle. Attached to any active keyframe are two bezier curve handles (one handle if a start or end keyframe). If the handle(s) are not visible, click the keyframe (or move the blue vertical frame marker near it). To decelerate, create an downward curve (shown). To accelerate, create an upward curve. To delete a keyframe, right-click it in the graph and choose Delete keyframe. Or click the Delete Key (-) button above the Keyframes window. To delete ALL keyframes for a control, right-click the control's stopwatch icon. To delete ALL keyframes for a control AND revert to the control's default value, right-click in the graph's gray background and choose Revert to default.  To quickly chose from several handy keyframe presets for the Progress control, click the small Presets button to the right of that control.  To hide/show the Keyframes Window, click the Keyframes Window button ("M") below the preview's bottom right corner. Note that each keyframable control has its own keyframes graph. To see the keyframes graph for a particular control, click the stopwatch icon at the left of that control. Or click in the turquoise color bar that is above the keyframes graph.  To jump to a keyframe, click it in the keyframes graph. But among tightly clustered keyframes, sometimes that can be difficult. Or you may want to activate a keyframe without accidentally changing its position. The solution is to use the button bar above the top right corner of the graph. For example, to activate the next or previous keyframe, click the Next Key or Prior Key button.  To copy and paste an ENTIRE keyframe line into another control, right-click the Keyframes graph background and choose Copy or Paste. Note that if copied values do not fit within the parameters of the paste location, they will be modified. To match ONE keyframe's value to another keyframe, right-click the keyframe that has the desired value, then choose Copy value. Then right-click the other keyframe and choose Paste value.  To adjust an ENTIRE complex keyframe line you've created, right-click the graph's background and choose an option to invert or flip the keyframe line, or Scale/Move to scale its peaks larger/smaller or shift its timing ahead/back -- a great timesaver over manual adjustment.  To customize the Keyframes graph display, right-click the Keyframes graph background to access four Appearance options, such as to show/hide the graph's grid lines or scroll bars. Any change will be remembered. Save window position opens the Keyframes window at a consistent screen location. Attach to main window keeps the Keyframes window attached if you move the main window.  To move a bezier handle that is on top of a keyframe,click to activate the keyframe that "owns" that handle. Then Ctrl-drag the bezier handle where desired.  To stay at a frame while adjusting keyframes elsewhere, right-click the graph's gray background and deselect Sync preview. This can be handy, for example, to adjust a bezier curve while seeing how it alters an earlier or later frame's look.  To snap a keyframe to the vertical playback marker position (when Sync preview is off; see above), position the vertical playback marker where desired, then right-click the keyframe you want to move and choose Snap to Time. If the marker's position is not possible because it is beyond an adjacent keyframe, the command will not be available.  To make automatic bezier curve adjustments (instead of dragging a handle), right-click the keyframe and choose Convert keyframe to. Then choose an option shown below. To modify ALL keyframes in a graph, right-click the graph's background and choose Convert all keyframes to. To zoom in, Alt-drag in the graph where you want to zoom. To zoom in vertically to the range where keyframes exist, right-click the graph's gray background, then choose Fit graph to keyframes. This can help you to fine-tune values in relatively flat keyframe lines. Other ways to zoom in vertically are: drag inward the vertical scroll bar, or Shift-click the Zoom In (+) button. Shift-click the Zoom Out (-) button to vertically zoom out. To bring the blue vertical playback marker into the zoomed region, click in the numerical scale above the graph. Set where the dissolve will start/end within the image, what image information will be used to form the dissolve, and edge softness. Set the Key at... Choose the target for the next two Key controls in this section. For example, when a white "Key Color" is selected, choosing "Start of dissolve in Clip 1" will start the dissolve in the first clip's brightest areas; "End of Clip 1" will end the dissolve in the first clip's brightest areas. Likewise in the second clip if "Start of Clip 2" or "End of dissolve in Clip 2" is chosen. NOTE: When applied to only one non-overlapped clip, choose a "Clip 2" option for the clip's head or a "Clip 1" option for the clip's tail. Key Type Choose the type of image information that will visually flow the dissolve over time. Click the adjacent Compare button to visually compare options. "Luminance" creates a dissolve based on brightness; a good choice to simulate optical/film dissolves. "Color" uses RGB values to start or end the dissolve in a particular hue within a clip. "Red channel" (or Green or Blue) uses the color intensity in one color channel. "Timing adjusted" options better match the dissolve's visual progress to the transition's actual start/end. Key Color Use the eyedropper or color controls to set where the dissolve will visually start or end within your images. For example, if white is selected the dissolve will start or end (depending on "Set the Key at..." choice) in the clip's brightest areas; if black, then in the clip's darkest areas. If a color is chosen, the dissolve will start or end in color areas that most closely match. To use the eyedropper, click it, then click in the preview image. Softness Adjust the edge softness of the dissolve. Shape Choose a shape from several options. "Inverted" choices reverse the dissolve's direction of flow. Use this section to conform the dissolve to a shape, partially or entirely. Create ultra-soft "directional dissolves" with a shape, for example, to subtly radiate a dissolve outward from any subject in a scene. Shape Choose a shape from several options. \"Inverted\" choices reverse the dissolve's direction of flow. Strength Set how strongly the dissolve conforms to the chosen shape. Position Position the shape within the image by dragging the center point. If "Linear Wipe" is selected, you can adjust its angle by moving the center point. For more precision, enter numerical values, such as to match the shape in two different dissolves. Mode 1 To fine-tune the look of the dissolving area within a clip, choose a Photoshop-like blend mode. NOTE: When applying DissolveMaster onto a single non-overlapped clip, blend modes other than "Normal" will produce irregular visual results. Mode 2 Optionally choose a second blend mode for further visual creativity. NOTE: When applying DissolveMaster onto a single non-overlapped clip, blend modes other than "Normal" will produce irregular visual results. Blend Mix Adjust the mix of Mode 1 and Mode 2. Greater values increase the relative strength of Mode 2. Mid Contrast Adjust the contrast in the dissolve area. Gamma Adjust the brightness in the dissolve area. Optionally ramp the clip's color saturation during the dissolve. Saturation Choose where the saturated color will appear. Strength Adjust the intensity of the color saturation during the dissolve. Optionally add a blur to the dissolve's look. Blur Choose where the blur will appear within the image. NOTE: When applied to only one non-overlapped clip, "Blur Clip 1 only" will be ignored at the clip's head and "Blur Clip 2 only" will be ignored at the clip's tail. Strength Adjust the blur's strength. Optionally add a glow to the dissolve. Color Select the glow color using the eyedropper or color controls. To use the eyedropper, click it, then click in the preview. Mode Set how the glow mixes into the images. "Add" tends to brighten or tint towards the chosen glow color. "Overlay" replaces the image with the chosen color. Size Control the glow size. Strength Set the visual strength of the glow. Transparent Turn on this checkbox to show lower track visuals (such as a still-image or video clip) in the glow area instead of a glow color. Progress Control the dissolve's progress over time, typically changing in value from 0 to 100. To ease-in/out the dissolve, adjust its start/end keyframes or add additional keyframes. To hold a dissolve, set two adjacent keyframes to equal value.